This is a Flickr badge showing public photos from flintstone.com. Make your own badge here. Click en el logo para ir a nuestro canal de facebook. Click en la camiseta para ir a la tienda online. Había un hombre llamado Tadashi Abe, recientemente fallecido. En cierta ocasión en que visité a O Sensei en al dojo de Iwama para saludarle tras mi regreso a Japón al finalizar la guerra [WWII], tuve el siguiente encuentro con él. O Sensei se encontraba feliz al saber que yo había regresado sano y salvo y me dio una calurosa bienvenida. Me quedé a dormir esa noche en el dojo. Esa noche vino a mi habitación un hombre de aspecto malvado con un corte de pelo a lo monje y me pidió permiso para entrar. Cuando le di el permiso él entró. Any offensive moves in Aikido? 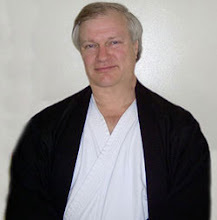 George S. Ledyard writes in Aikiweb the following while discussing whether there is any offensive move in Aikido or not. I'm absolutely with him on this one. Every response you execute when grabbed can be done when grabbing. Every atemi you execute when attacked can be used when attacking. We need to lose this whole uke / nage dichotomy. We also need to stop attaching pseudo moralistic value judgments to things like who initiates. Peace is something you carry inside you. It's not something that has to do with who moves first. It is an attitude. The misunderstanding of what the attacks really are that we routinely do in our daily training causes us to attach all sorts of baggage to the whole uke / nage relationship which shouldn't be there. This is caused by allowing two different mindsets and two different physical skill sets on the part of uke and nage. Nage is supposed to be relaxed and "defensive" in attitude, executing techniques of great technical sophistication while Uke attacks like an idiot, typically either is too tense or fails to really connect effectively. What would an attack look like if the uke knew what the nage knew? If Aikido training was about BOTH partners having the same access to "aiki" skill sets we wouldn't have the need for discussions like this because people would understand what they are really doing, or choosing not to do, depending on the level of practice. A katatetori would break nage's balance instantly on contact and set up the atemi with the off hand. No one would be under the misconception that an attack has anything to do with not allowing the nage to move but rather to compromise his structure and make it impossible for nage to defend against the atemi. We need to get way past trying to impute some sort of moral, right and wrong value judgment to the term "aiki". "Aiki" can be used for good or evil. That's why O-Sensei felt it was important not to teach technique to people not of good character. I spent a number of years teaching law enforcement and security personnel. LE officers are required to initiate technique on subjects who are e-gressive, not just a-ggressive. I can assure you that "aiki" works just as well when the person initiates as when he is being attacked. Virtually every technique in the Aikido repertoire can be used as an attack, not just a defense. The circumstance and ones personal mindset determine whether this is "violent" in an immoral way or not. Found this today in the aikiweb and thought it was so irreverent and hilarious I would rather share it here for you. Enjoy! Got up and went up to the roof to greet the Sun Goddess. Of course, our conversation took place by means of the jo. I fail to understand why Kisshomaru does not make more use of this wonderful instrument. After all, I used it often enough. Had a lengthy discussion with Amaterasu about her grandson Masakatsu Agatsu. I told her that he was my favourite deity, along with her brother Susano O, but this did NOT go down very well AT ALL. She told me that she is still having severe problems with Susano O and these problems were affecting the entire universe. 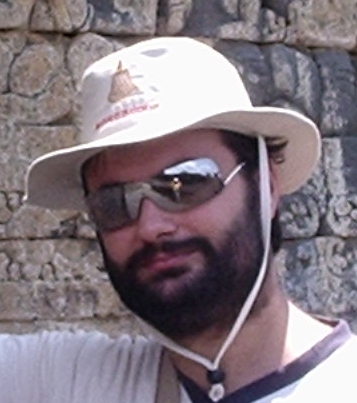 They are also interfering with my own work as the main Avatar between the Three Realms. Here am I, standing on the Floating Bridge of Heaven and constantly training to ensure that Aiki is Aiki (I am glad the Japanese language is so rich in resources; it is completely different from dull, boring English), but the continuing problems with Amaterasu and her brother are making things very, very difficult. So I reassured her with the remark that the whole problem lay in the English translation. English simply does not have the resources to capture the full range of meaning encapsulated (spelling correct?) in the phrase Aiki is Aiki. I gather that all my discourses are being translated into English by some Buddhist professor who lives in the north of Japan. (I know about him because he sometimes wears flowery hakama and does kotodama chants in English churches: at least this is a welcome change from the deadly boring chants I hear in Japan.) I explained that the professor had translated the name Masakatsu Agatsu as Victory OVER Oneself, not Victory BY Oneself, which is MUCH more meaningful than anything about winning and losing, especially to our dear American students. By the way, I gather that a film has come out with the name Avatar. When I first heard about it, I was very happy and hoped that it would take account of my work on the Floating Bridge of Heaven, uniting the Three Worlds, but the movie was a TOTAL disappointment. The love interest was COMPLETELY wrong and involved silly relationships with strange people in blue, with long noses and wearing tails. If people start wearing tails for aikido training, we are going to have to redesign the whole range of keikogi, especially the pants and hakama. So I told my grandson Moriteru to deal with this, but however, he seemed TOTALLY unconcerned. "Ojii-chan," he said, "if people come to the Hombu Dojo wearing tails, be assured that we will deal with the situation very effectively. We are now a very efficient, smoothly-running organization." I was unconvinced, for I read somewhere that the folds in the hakama represented seven virtues; but we are now going to have to add an eighth virtue, for the correctly folded tail. What IS the world coming to? Anyway, I have not seen anyone wearing tails during training so far, but I must consult with Deguchi Sensei. He might have encountered some Blue Avatars during his later trips through the Spirit World. Deguchi Sensei is a constant source of inspiration, much like Goi Sensei, though the spiritual methods of the two are completely different. Deguchi Sensei is very refreshing, constantly regaling me with reports of visits to the spirit world and his activities with the spirits, though his use of the Male Member makes one blush. Goi Sensei, on the other hand, is rather more pedestrian, though he agrees with me much more often. However, all he seems to do is put up prayer signs everywhere wishing for peace on earth. Of course, this is all very worthy, but I don't like to tell him that my own work on the Floating Bridge of Heaven, working to unite the Three Realms, fully in tune with with Aiki as Aiki, is MUCH more effective than prayer signs. But only time will tell. Went downstairs and prepared for practice. Decided to explain in more detail about the kotodama sound SU and how it created the universe. BUT EVERYTHING fell on TOTALLY stony ground (Now where have I heard this phrase before? Note to self: this is a very good phrase, totally appropriate for the current crop of uchi-deshi: I must start using it very often). Everybody just sat there looking stupid. They were probably hoping I'd stop talking and do some techniques. I am sure you can see the picture: people look at you intently and nod vigorously, hoping you will think they understand, as they shift their knees slightly from sitting in seiza for a long time. But when I finally summoned the Big American to take ukemi (I think his name is Dogson, Dodgson, Dobson, Fogson, Edison, or something like that: I prefer to call him Teru), he was far too powerful and got the timing, everything, completely wrong. Heavens, he couldn't even do the boat rowing exercise correctly and he should know by now that this is absolutely crucial for summoning the right kami for the training. When will these uchideshi ever learn? Was still feeling grumpy after keiko, only to discover that the uchideshi on duty had not filled the morning bath water correctly. He had checked the temperature by putting his hand in the water, causing total contamination. They should know by now that bath water—any kind of water, has to be pristinely pure. Otherwise it is entirely useless for misogi. I keep on talking about this during keiko, but the uchideshi simply do not seem to get it. Only the other day, one of the deshi appeared in his underwear, for Heaven's sake. I think it was Saotome. So I sent him off the mat very promptly and made him sit in seiza and watch. Felt much better after breakfast, which was duly prepared by She Who Must Be Obeyed, though she tore a strip off me for having to stitch my hakama, because some silly uke had torn it. She blamed me for not controlling my uke correctly, rather than the uke for not falling properly. (Obviously she knows rather more about aikido than I had realized.) During breakfast my wayward son was muttering something about doing some kind of public demonstration. It is so unfortunate that he failed the medical exams for the military. A spell in the Japanese Army, or even the new Occupation Forces (I think they are called Marines and from the look of some of the soldiers they appear to accept foreigners) would have given him some much-needed backbone. Had another long conversation with Amaterasu and decided to go to Iwama, to talk in more detail with Susano O. Announced this to She Who Must Be Obeyed and there was a major panic. I have no idea why. She muttered something about train times, but I assured her that I ALWAYS arrive at the station at least one hour before the train departs, so there was no need to worry. Was assigned the deshi who killed the dog (I think his name is Chiba), but was told that my son Kisshomaru would also accompany me. I gather he wanted to discuss something very important. I MISSED THE TRAIN TO IWAMA. This has NEVER happened before. I arrived at the station one hour before the train was due to depart, but discovered that I was five minutes late: the train had already departed. And Kisshomaru and the deshi were nowhere to be found. I was so annoyed. However, Deguchi told me to be patient. He had consulted with some of his own deity friends and assured me that it was my destiny to arrive in Iwama today. Finally arrived in Iwama and took a welcome bath. The water was fine. Kisshomaru, who had taken the right train, was there to meet me with Saito Father and Son. Went to the shrine and discussed current issues with Susano O involving the Three Worlds. Explained about Amaterasu's problem, but I was quite astonished when he suggested I see the new Avatar film again—and he seemed quite unfazed about the strange noses and the tails. Told me that aikido had to be fully in tune with ecology, whatever this is. Had a painful discussion with Kisshomaru after keiko. Apparently he has decided that aikido has to be popular, now the war has ended, and so wants to hold a public demonstration. When I retorted that one only does demonstrations in the presence of His Majesty, or on anniversaries of His Majesty, he held his ground and told me that he had the idea in August, 1945, when His Majesty announced Japan's surrender. Kisshomaru clearly has more backbone then I previously thought; obviously, he has been talking to his mother. I was rather shocked when he told me that the venue would be the ROOF of a department store, but he backed this up with an argument that many people would attend if it was held there and, anyway, aikido had to become relevant to the lives of common people, not aristocrats. Of course, he said he understood the sterling work I had been doing keeping the Three Worlds together, but stressed that his own work was firmly down here. He was quite firm about this and his second argument was that the Tokyo dojo had to be torn down and replaced with something much bigger and more fitting for aikido as a worldwide budo. Can't argue with that, though I shall miss the old wooden dojo. I told him to leave Iwama as it is, though. In any case Saito is still here and he is quite capable of standing up to Kisshomaru. Standard Disclaimer: All opinions you can find here, are mine and only mine. They do not necessarily represent the opinions of any of the groups I'm a member of. Actually they are likely to be somehow controversial, for that's my very own nature. Blame them on me. Flintstone's Cave by Alejandro Villanueva is licensed under a Creative Commons Reconocimiento-No comercial-Compartir bajo la misma licencia 3.0 España License. Based on a work at flintstonecom.blogspot.com.